Americans' news-consumption habits are changing quickly, and with them, so is the job of White House press secretary. When Josh Earnest steps to the podium to replace Jay Carney as White House press secretary later this month, he’ll do so amid a seismic shift in news-consumption trends – as if worrying about sparring with often-contentious members of the media wasn’t enough. However, the fact that consumers’ news preferences are trending toward Twitter and other digital sources and away from the nightly network news and mainstream outlets does not mean the role of the president’s top spokesman is diminished. It’s still the tip of the White House’s communications spear, but it’s no longer the only weapon an administration has to get its message across. "Whenever I talk to [other former press secretaries], I’m always struck at how totally different the process is and the effort it takes now to wrestle the news cycle to the ground every day. In my time, we had the luxury of taking a deep breath after the network shows, but now it goes 24/7," explains Mike McCurry, one of former President Bill Clinton’s four press secretaries. "When there was a mainstream press that dominated the flow from the White House, at least you had some chance of trying to break through. Now it’s like throwing spaghetti at the wall all the time." A number of factors contribute to this frantic pace. Reporters at outlets formerly considered "print publications" now update their stories throughout the day, a far cry from the one or two deadlines they used to have. And while the press room is still dominated in many ways by the household-name media outlets, blogs, websites, and other less-conventional media have also staked their claim. That’s not to mention Twitter, where journalists and John Q. Public alike drive the news cycle on a minute-by-minute basis. "When I was there, everybody became a wire reporter," says Robert Gibbs, the first White House press secretary for President Barack Obama. "Everyone’s story was constantly updated and available, and they didn’t wait a few hours to update the story. It all happened instantly. That drove things in a way that they had not before, and technology did, too. Twitter particularly was a big advance in how you broke news and how you responded to news." Yet the daily press briefing still plays a prominent role in the White House’s messaging strategy, just not the be-all-and-end-all position it once held due to myriad other ways a president’s team can get its side of the story out, notes Bill Burton, former deputy White House press secretary and now an EVP and MD at Global Strategy Group. "In the diverse news environment, the briefing is a critically important part of the way the White House gets information out, but it is a smaller and smaller piece of the pie," he says. "And with Twitter, Facebook, Tumblr, and all the different ways the White House has engaged to make sure people know what the president is up to and why he’s up to it, there are many avenues that are important." The gravity of having a presence on social media, especially Twitter, can’t be underestimated. A far cry from the 2008 election, when the winning Obama campaign tweeted once after its victory, now most prominent White House officials have accounts on the microblogging service, as do various former press secretaries and communications aides. 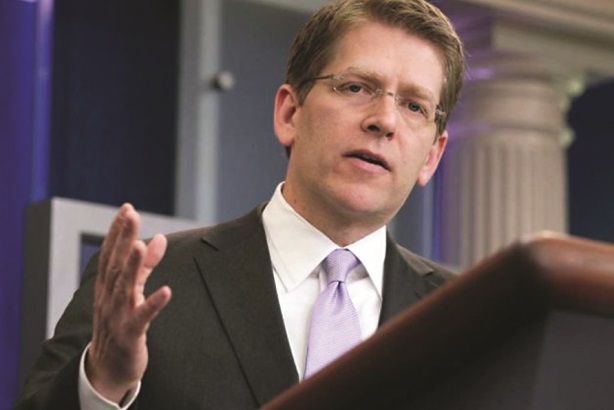 Current press secretary Jay Carney maintains the @PressSec account, while Earnest uses the @jearnest44 account. For communications aides, using Twitter is about countering misinformation as much as getting their own story out. "It’s absolutely necessary for [press secretaries] to engage where the press is engaging. If people are getting information from Twitter, you have to make sure they are getting information from you on Twitter," Burton explains." You can’t cede any ground; that’s how you allow false and misleading information to prevail." The White House’s digital interaction with the public is not limited to Twitter by any means. Just like major consumer brands are increasingly going around the mainstream and trade press and straight to consumers by creating their own content, the Obama administration has embraced a similar strategy. After only a quick glance at WhiteHouse.gov, one can see a promotion for the president’s first Tumblr Q&A next Tuesday, as well as videos and infographics about his infrastructure plan, immigration strategy, and his ongoing trip to Europe. Meanwhile, the "photo of the day" section shows Obama dealing with leaders from Ukraine, Poland, and Great Britain, among other shots. The White House’s most recent blog deals with employment statistics for May, released just hours before. And while presidents have used weekly radio addresses for decades, the Obama administration put a new spin on the tactic with West Wing Week, a weekly webisode that describes the president’s priorities and actions from the past seven days. Underscoring the importance of these tactics is the fact that Earnest, the narrator of West Wing Week, will step into the top communications role at the White House this month. "The biggest difference is the press secretary has become one member of an integrated communications team at the White House. While they are focused on the traditional media and the news cycle, they are doing that against a backdrop of content and conversation that never stops," says Jonathan Kopp, MD and chief interactive strategist at Glover Park Group and former partner and global director of Ketchum Digital. "That’s the context. There’s the reactive and the proactive, and the press briefing, while it is the press secretary’s province, really is one people of a multi-tactical operation." Twitter quickly revolutionized how the media interacts with the people it covers, as well as those who consume news, after it quickly gained popularity in 2008 and 2009. The first time former Obama White House press secretary Robert Gibbs used the microblogging service, he was at a press conference and noticed deputy Bill Burton using it on his iPad. "I started watching reporters react to what the president was saying as he was saying it, and I thought, ‘Wow, I’m inside the process. How can I not be on something like that?’" he recalls. Gibbs, now founding partner of the Incite Agency, says he found Twitter useful for pushing out details of the president’s schedule to reporters, but even more helpful for seeing what journalists were thinking about comments delivered at press conferences. "Using Twitter effectively isn’t just, ‘Here’s my story of the day,’ he says. "It’s instant analysis and reaction. I thought, "I’m seeing the thought-bubble box right over [reporters’] heads." West Wing Week, which serves as a de facto newscast for people who want information straight from the White House, has contained footage of events and ceremonies closed to the press. Gibbs adds that reporters looked at the Obama administration’s digital operation with plenty of skepticism during the president’s first two years in office. Yet he makes the case for the administration creating its own content, saying, "The White House has a requirement to speak directly to citizens, or in a brand’s case, to consumers. "You can’t wait for the interaction with the press corps or the filter," he adds. "You have a responsibility and obligation to speak with the people." But the growing digital operation around the press secretary – not to mention the team that monitors and analyzes news coverage on a 24/7 basis – does not mean the position has been downgraded. Experts argue that of all the communications tactics at the West Wing’s disposal, the daily press briefing continues to have the longest reach and the most gravitas. If world leaders and business magnates want to know the White House’s position on an issue, they’re watching the daily briefing rather than looking for infographics. "Think about who is watching [the briefing] around the world. There are democracy supporters in Syria, there are potentially terrorists in Afghanistan, clearly people in Moscow," says Howard Opinsky, US public affairs lead at Hill+Knowlton Strategies and the former national press secretary for Sen. John McCain’s 2000 bid for the White House. "There is also body language that goes into it, and don’t underestimate Wall Street as well. Investors are consuming every hint that comes out of the White House." Asked if new and social media have made the press secretary’s job easier or more difficult, Kopp says the answer is both. "It’s easier because they have so much more self-publishing opportunities and softer news outlets through which to take its message right to the people, such as the president doing Between Two Ferns or the first lady appearing on The Colbert Report. They can also call on bloggers and niche outlets during briefings and other major news conferences," he says. "On the other hand, the job is more complicated. It used to be that traditional media drove social media chatter, now you see anchors on live broadcasts quoting directly from Twitter, so that means the White House has to have its finger on the pulse of outlier media outlets. They need to operate through a 24-hour news cycle and be more creative." One part of the job that is not likely to change is its near-impossible balancing act of trying to keep both "constituencies" – the press and the president – happy. Experts disagree on whether briefings are more confrontational than in the past, when press secretaries sparred with often-truculent journalists such as Sam Donaldson or Helen Thomas, but tempers flare at times. Revelations that the Justice Department subpoenaed the phone records of Associated Press reporters in 2013 to find a source further stressed the relationship between the two sides. "The press secretary has to maintain the very uncomfortable balance between his constituency in the media and providing them with information and his or her constituency in the White House and the administration," says Ogilvy North American CEO Rob Mathias, who worked in President George H.W. Bush’s administration. "That age-old conundrum still exists, but only amplified by the technology shifts we’ve seen. That tension is still there but more pronounced." As if the press secretary needed another reminder of this strain, his or her office is somewhat metaphorically placed between the Oval Office and the White House Briefing Room, notes McCurry. "When you go outside the office and turn right, it goes toward the Oval Office, if you turn left, there’s the Briefing Room," he says. "You’re caught between the role of the president and the role of the Fourth Estate and working hard to keep both sides of that equation happy, though it’s not always possible." What should Josh Earnest’s first priority be as White House press secretary? White House press secretaries: Where are they now? Gibbs prepares for the "Twitter election"